p(blue). Editor's note: Helen Rennie wrote the Front Burner column from January to June 2007. When it comes to equipment talk, knives get all the glory. They're big, sharp, shiny, and glamorous. But what about the knife’s faithful sidekick, the cutting board? Without a proper board, even the best knife is like Batman without Robin. It took just one knife-skills class to teach me the importance of a good cutting board. When I first asked my students to each bring a chef’s knife and a large cutting board to class, I was mostly worried about knives. I bought a ton of extra Forschner knives, expecting that not everyone’s knife would be in working condition. I didn’t even think about the boards. “Who doesn’t have a cutting board?” I thought. I think this small-board/small-knife phenomenon comes from our immense dislike of prepwork. When we dine in a restaurant with an open kitchen, we want to see the cooks grill, sauté, and drizzle interesting sauces over plates; we don’t want to watch them chop parsley. So when we cook at home, it’s our pots, pans, grills, and mixers that take center stage, not boring old boards and knives. But prep is unavoidable. Many dishes start with a chopped onion and finish with a sprinkle of herbs. We can either lament prep, trying to make it invisible by using tiny knives and boards, or embrace it, making it comfortable and enjoyable. You want a board that’s at least a little bigger than your knife. My favorite size is 11 by 15 inches, which is large enough for most chefs' knives but small enough to fit into my dishwasher. Dishwasherability is one of my requirements for any board I plan to use for fish, meat, and poultry, since it’s the only way to properly sterilize them. Plastic and wood are the best materials for cutting boards, but in the interest of practicality, my vote is for plastic. Wooden boards have to be washed and dried by hand. 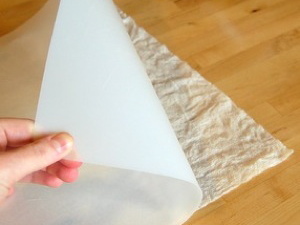 Running them through a hot dishwasher or leaving them to dry slowly in the dish rack can make them dry out and crack. Ideally, wooden boards should also be oiled on a regular basis, and that’s way more work than I am willing to do. So I buy plastic. What about all those cute glass cutting boards with pictures of peppers, olives, and wine bottles? Unfortunately, they are your knife’s worst enemy. If you want your board to be a proper sidekick of your knife, its job is to protect the knife’s edge, and any material that’s harder than your knife’s blade — like glass, ceramic, or granite — will take the edge right off. Hang these pretty boards on your walls as decoration; don’t let your knives go near them. If you go the cheap and practical plastic-board route, you’ll have two things to consider: the smoothness of the surface and the weight of the board. 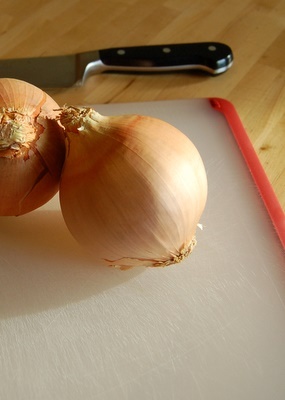 You want the board’s surface to be as smooth as possible in order to produce clean cuts; you don’t want to end up with partially chopped chives and other delicate herbs. A smooth surface also makes the board easy to wash, and food doesn’t get stuck between the tiny bumps so common in plastic boards marketed to home cooks. This surface roughness, I assume, is an anti-sliding feature, but simply putting a damp paper towel (or cloth dish towel) under your board solves the sliding problem. There are no rights or wrongs when it comes to board weight, as both the sturdy heavy boards and the flexible lightweight ones have pros and cons. The benefit of a heavier board is that it can go in the dishwasher without warping. The downside is that it takes a bit more space to store, particularly if you like to have three or four boards. 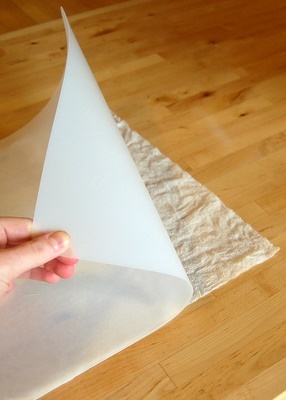 The benefits of the flexible boards are that they take up almost no space and, since you can bend them into funnels, are handy for transferring ingredients. The downsides are that they warp in the dishwasher and have to be washed by hand. My solution to this dilemma is to have both. I have a thick board for fish, meat, and poultry which I can throw in the dishwasher, and I have a few flexible mats for veggies which I can just rinse and put in my dish rack to dry. My favorite thick board is an OXO Good Grips Utility Cutting Board (10.5 by 15 inches). It’s dishwasher-safe, has a smooth surface, and even comes with little rubber feet at the corners that prevent it from sliding. For flexible boards, I prefer ones that are completely smooth on both sides. Avoid ones with special features like the Crate and Barrel Flexible Grip Mats. The ridges on the back don’t help with the sliding problem, and make washing and drying the board a real pain. Next time you want to pamper yourself with a kitchen toy, don’t feel like you have to spend $200 on a KitchenAid that you’ll use three times a year. Instead, invest $20 in a few good cutting boards and turn your daily prepwork into a pleasure, not a chore. p(bio). Culinate columnist Helen Rennie is a food writer (check out her blog) and cooking teacher living in Boston.